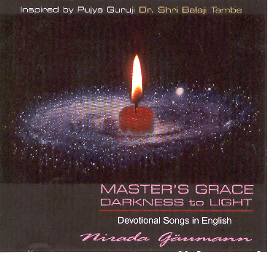 Nirada Gäumann, the composer of Master's Grace - Darkness to Light, is a post graduate in music therapy from Zurich University, Switzerland. She has immense love for Indian philosophy and music and is an avid student of Indian Classical Music. Ulla Sachers is a post graduate in music from Munich University, Germany and Jana Rosenhagen has an inborn talent with a melodious voice.